Update: February 28, 2019 – HB 161 failed in the Utah Senate Transportation, Public Utilities, Energy, and Technology Committee by a vote of 3-2. The bill had recently passed the full Utah House and looked poised for potential passage. The Senate committee had three missing senators, at least one of whom, Don Ipson has supported the bill previously. Senators Mayne and Riebe voted yes. Senators Harper, Anderegg, and Winterton voted no. Senators Ipson, Buxton, and Adams did not show up to vote. The bill has failed for now the fourth time this decade, often by just one vote or by not coming to a vote (last year's Senate did not schedule the vote in time). Rep. Moss had previously stated that she would keep bringing it back until it passes. January 31, 2018 – Salt Lake City, Utah – The Utah Yield (Idaho Stop) Bill, HB 161 is in the Transportation Committee in the Utah Legislature today. Cyclists are needed to testify in favor of the bill, which would allow cyclists to treat stop signs as yield, and certain red lights as stop signs. The committee hearing starts at 2 pm. in room 30 of the House Building in the Utah State Capitol complex in Salt Lake City. Committee members can be contacted here (before 2 pm) if one can't attend the hearing. Talking points are listed below along with a short video. 10 bicycle on the roadway. 28 ▸ makes technical changes. Cycling Utah supports this bill for multiple reasons. In Idaho, crashes dropped after the 1982 law went into effect. The bill legitimizes typical cyclist behavior at stop signs and many stop lights. 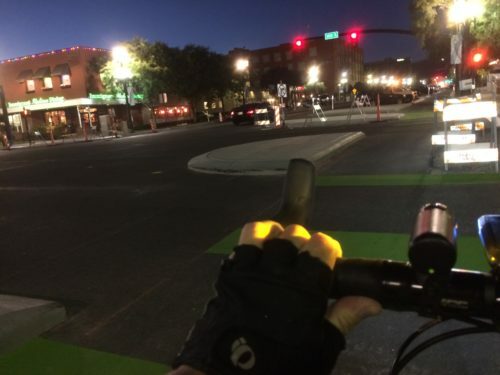 Additionally, at stop lights, for the most part, the bill moves code governing cyclists from one section of the code to another. The bill does not allow cyclists to blow through stop signs or stop lights. to determine whether to stop or yield based on traffic conditions in order to maintain their momentum. The study shows that only about one cyclist in 25 presently complies with the law to come to a complete stop. A pilot program to allow Idaho Stops at certain traffic signal intersections when traffic volumes are relatively low may also be considered. 2 Responses to "Update – Utah Yield (Idaho Stop) Bill – Fails in Senate Committee (Feb. 28, 2019)"
Well, I would rather they enforced the traffic laws on autos using “Idaho stops” at intersections, stop signs and red lights. I would REALLY like it if the would enforce the 3 foot clearance rule for bikes on the road. Better yet, producing video evidence of a violation could lead to a warrant for a motor vehicle operators arrest. It isn’t an either-or situation here, but should be seen as “yes-and”. I agree, Bruce, that enforcement of current law is an issue for local and state jurisdictions. And I agree that it is sorely lacking, unfortunately. Speak up to your local officials and in the meantime, please also support HB161.